In the age of 24 hours news, sometimes it’s hard to know how to measure time. Last week the news narrative careened through three distinct, often dramatic phases, and ended overwhelmed by a celebrity story that echoed coverage from more than a decade ago. As the week began, the continuing protests in Iran, now into their third week, dominated the media. But as the Iranian government began to drive the protests underground, coverage began to recede—even if the tensions in the country had not—a sign that street protests may be easier to cover than political maneuvering behind closed doors. By Wednesday afternoon, media attention was already shifting from protest to disgrace when South Carolina Governor Mark Sanford made a stunning admission of having an extra-marital affair after having gone missing for several days. Then, late Thursday afternoon, the reports ricocheted across Twitter, celebrity gossip Web sites and mainstream media alerts that Michael Jackson, the self-described “King of Pop,” had been rushed to the hospital in cardiac arrest. The tabloid celebrity Web site TMZ.com was the first to report that he had been pronounced dead. The Los Angeles Times soon confirmed, and within a few hours, Jackson’s demise proved to be the biggest celebrity story in perhaps a decade, something akin to the death of John F. Kennedy, Jr. in 1999 and perhaps even that of Princess Diana in 1997. For the week, the protests in Iran ended up being the biggest story, totaling 19% of the newshole studied during June 22-28 by the Pew Research Center’s Project for Excellence in Journalism. Though he died Thursday night, Michael Jackson’s death was nearly as big, filling 18%, and Governor Sanford’s story, which fully broke on Wednesday, was third at 11%. But that time unit doesn’t capture the feel of the week. By week’s end, every other event struggled for attention amid the cascade of Jackson video clips and remembrances, panel discussions and interview segments. It was a reminder of how the media at times can be captivated by the hold of celebrity on some people’s lives and at the same time will eagerly exploit it. From the time it was announced Jackson had died through the end of the day Friday—a little more than 28 hours—60% of the news coverage studied across 55 different news outlets was devoted to Jackson’s death. And that does not include the broadcast network prime time specials devoted to the singer’s demise—two of them for two hours Thursday night and one for a single—the extra hours of morning news and more. All media sectors covered Jackson heavily, but it was cable news channels that led the way. 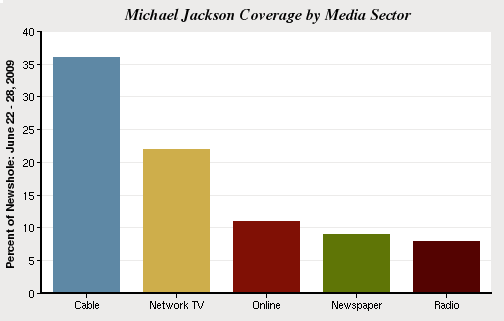 Fully 93% of cable coverage studied on the Thursday and Friday following his death was about the King of Pop. On the front pages of Friday morning newspapers, 37% of their coverage was Jackson-related compared to 55% of the leading online coverage. If anyone needed proof of how much the media culture has changed it might be this. When Elvis Presley died in 1977, CBS News was criticized for choosing not to lead its newscast with it. As the week began, the media narrative was focused on whether or not Iran was at the brink of revolution. During the first two days of the week, nearly a third of all coverage studied (31%) focused on events in the country. A cell phone video of a young woman bleeding to death after she was shot during a protest appeared online early in the week and almost instantly Neda Agha-Soltan became the face of the protest movement, her image appearing repeatedly on cable and the video of her dying a staple on YouTube. Yet even the iconic video was not enough to sustain the coverage. By the middle of the week, Iran started to lose steam as a story as the protests grew smaller and the story of political turmoil grew more complex than simply protests in the street. Comparisons to the 1979 revolution, when the Shah of Iran was ousted, gave way to discussions of the failed student protests of 1999, a less well-remembered and more complicated event. By Wednesday, none of the three major commercial network evening news shows led with the Iranian unrest – something that they had all done the previous two evenings. Instead, the story of unrest abroad lost its preeminent spot to an emerging political scandal at home. The reports that South Carolina Governor Mark Sanford was missing from the start had the added dimension of something being odd, something not being quite what it seemed. Sanford had been AWOL for six days. Someone in his office speculated that he might be hiking the Appalachian Trail. Then, after days of speculation as to his whereabouts, Sanford surfaced, returned to South Carolina and said at first that he wanted something “exotic” and had gone to Argentina. By Wednesday afternoon, the media was feasting on what has become a familiar political ritual, the politician, tearful and remorseful, admitting at a hastily prepared press conference to an affair. Sanford’s rambling confession was broadcast live on numerous cable outlets and C-SPAN. While it resolved the question about where he had been, it opened up a whole set of other questions, including whether the Governor would resign and why his staff had told reporters that he had been hiking. The story built through Thursday with a growing cascade of calls from within his own party that he should resign. Like other political scandals one subtext here in the press was the strength of the scandalized politician’s political network. A popular politician may survive things that a more abrasive character might not. Sanford was quickly seen as something of a loner who didn’t have many friends. For instance, on Thursday on cable, consultants in his own party were saying that he should go, especially if there were any hint that he had used public money to finance his liaisons in Argentina. Within a few hours, at least one trip of that nature surfaced, paid for with state funds. Sanford announced he would give the money back as he struggled mightily to hang onto his job. The story also quickly became one about the Republican Party. In the wake of revelation of an affair by Nevada Republican John Ensign a week earlier, many pundits were asking if this was a pattern the GOP should be worried about and what the political consequences might be. In the sometimes ghoulish calculus of the press agent, Sanford may actually have been a little lucky. Before 48 hours were up, some of the media oxygen that might have been devoted to demanding his resignation would disappear. Shortly after 12:30 p.m. on Thursday, June 25, the word hit that 1970s pin up sensation Farrah Fawcett had succumbed in her battle with cancer. On cable, the predictable pictures quickly appeared. There were images from her recent documentary about her battle with the disease. There were shots of her during her one season on Charlie’s Angels. And there was the poster, the one in the red one-piece bathing suit, with the head tilted and the innocent but also slightly ferocious smile. On CNN, before com mercial breaks, the news channel was matching photos of Sanford and Fawcett to keep the audience watching. There were promises of a retrospective later that night. But by around 4:30 that afternoon, all that was washed away. News spread on the cable networks and online that singer Michael Jackson had suffered a cardiac arrest and was being taken to a Los Angeles hospital. At 5:20 p.m., the celebrity gossip Web site TMZ.com added a post simply titled, “Michael Jackson Dies.” The Los Angeles Times soon confirmed the singer’s death becoming the first mainstream news organization to do so. Wall-to-wall coverage of Jackson’s life and passing ensued. The cable news channels went live with interviews of countless celebrities giving their reactions to Jackson’s death and repeatedly showed footage of Jackson being taken from his home by ambulance to the hospital along with live shots of crowds now forming outside the hospital as well as his home. For different periods over the next few hours, each of the cable news channels went without commercial breaks in order to cover every breaking detail. “It’s resonating all over L.A. right now…that this might be the day that’s considered that pop music died,” Carlos Diaz of the television show Extra told Keith Olbermann during MSNBC’s live coverage. “We’re doing this story. It’s of interest. Whatever you think of him, [people] were fascinated by him–whether you hated him or you liked him,” declared Fox News host Bret Baier speaking over live overhead footage of the UCLA hospital where Jackson was being treated. That night, ABC and NBC both expanded their 9 p.m. shows that were supposed to be devoted to the death of Fawcett to two hours and shifted the focus to be about Jackson instead. CBS ran its own special at 10 p.m. And the music cable channels MTV and BET both ran marathons of Jackson’s videos. Jackson’s death also created a unique online situation due to the overwhelming public interest. Most of the initial Jackson coverage involved retrospectives of his life and career. Fully 60% of the coverage studied by PEJ fell into that category. Another 31% focused on the potential causes of death including rumors of drug abuse. Just 3% was about the legal issues involving his sizable estate. The closest analogies to the coverage in recent memory are probably John F. Kennedy Jr., who died in a plane crash or Princess Diana, who died in a car. Yet neither of those public figures could be celebrated for their artistic accomplishments—as Michael Jackson was—for changing popular culture, music, singing style, dance and even music videos. On balance, at least so far, the press has appeared less uneasy about its fascination. There were other stories in the news last week. The fourth largest, at 7%, was health care reform, largely focused on negotiations in Congress over President Obama’s proposals. The fifth story (also at 7%) was the U.S. economy, embodied in a range of storylines from difficulties in the banking market to the continuing effects on state governments. And the tragic subway crash in Washington, D.C. was the sixth-largest story of the week receiving 5%. Interestingly, the deaths of two other celebrities were crowded out last week by coverage of Jackson. Fawcett’s death and that passing of famed TV sidekick and personality Ed McMahon each received about 1% of the week’s coverage. Breaking late in the week, Friday, the House passage of historic legislation to impose limits on global warming received relatively marginal coverage, roughly 2%. As the story of his death raced to the top of the news agenda, Michael Jackson became the most-talked-about person in the news this week (15% of all stories). This was only the second time this year that anyone was able to dethrone President Obama as the top lead newsmaker. Obama’s Supreme Court pick, Sonia Sotomayor, had been the only other person to do so. This week four of the top six lead newsmakers were people who had recently died–Jackson, Fawcett, McMahon and Iranian Agha-Soltan. 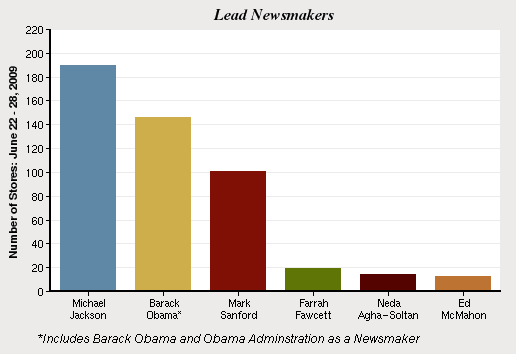 After Jackson, Obama was the lead newsmaker in 11% of all stories. He was followed by Mark Sanford (8%), Farrah Fawcett (1%), and Neda Agha-Soltan (1%). Ed McMahon, the first celebrity death of the week, came in at number six, also with 1%. PEJ’s weekly News Coverage Index examines the news agenda of 55 different outlets from five sectors of the media: print, online, network TV, cable and radio. (See List of Outlets.) The weekly study, which includes some 1,300 stories, is designed to provide news consumers, journalists and researchers with hard data about what stories and topics the media are covering, the trajectories of that media narrative and differences among news platforms. The percentages are based on "newshole," or the space devoted to each subject in print and online and time on radio and TV. (See Our Methodology.) In addition, these reports also include a rundown of the week’s leading newsmakers, a designation given to people or institutions who account for at least 50% of a given story.